Sometimes in spring or summer, you might see a fledgling songbird: Like a toddler, it’s unsteady, awkward, and learning the ropes. And you might wonder if the young bird has left the nest too soon. (In the case of this Black-capped Chickadee, just 16 days after hatching) But a nest full of begging young can be a target for a predator. So there’s an adaptive advantage for nestlings to exit the nest as soon as they are able, even if they’re not quite ready to fend for themselves. that’s just left the nest. It’s a fledgling: fully feathered, but with wings and tail still looking a bit stubby. Fluttering furiously on those short wings, it flies a short distance to the safety of a nearby bush. Like a toddler, it’s unsteady, awkward, and learning the ropes. It may look like this young bird has left the nest too soon. 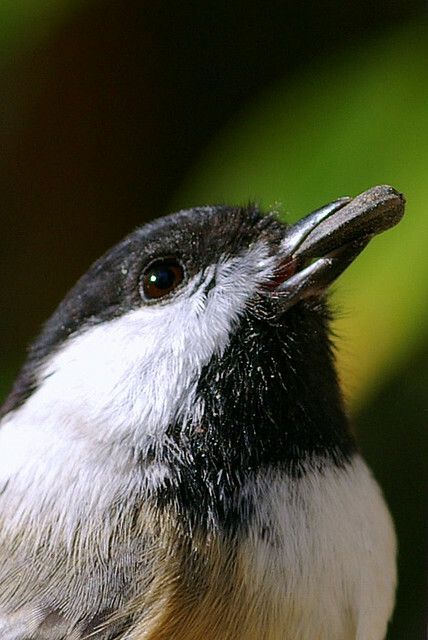 In the case of the Black-capped Chickadee, just 16 days after hatching. But there’s an adaptive advantage for nestlings to exit the nest as soon as they are able, even if they’re not quite ready to fend for themselves. A nest full of begging young can be a target for a predator. Rather than risk the whole brood to a raccoon or snake, adults may feed the young – one stashed here, one there – in greater safety, as they toddle from shrub to shrub. 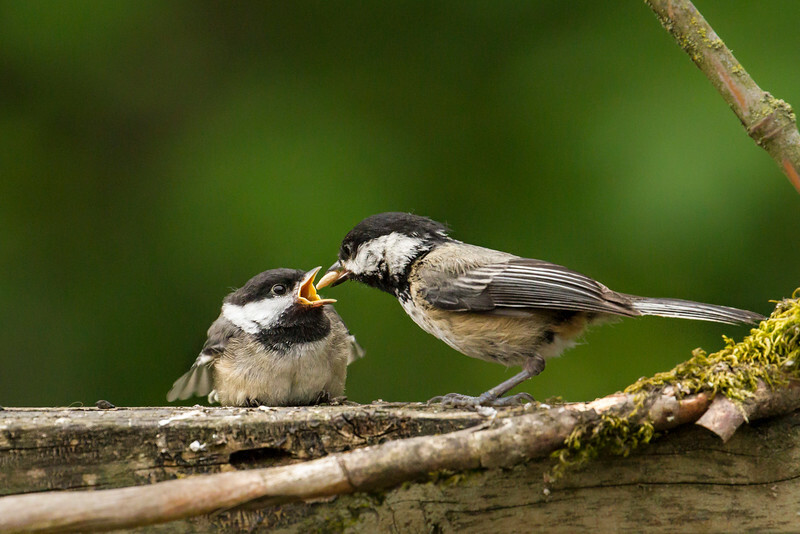 By about the tenth day after the young leave the nest though, chickadee adults stop feeding them and may even turn aggressive. Meaning it’s time for the youngsters to disperse and feed themselves. At this point, they’re fully fledged, should have their full set of flight feathers, and be ready to take to the skies. One good source on chickadee fledglings is Donald W. Stokes, A Guide to Bird Behavior, Vol. I. Little, Brown, 1979. Check out this gawky chickadee kid!